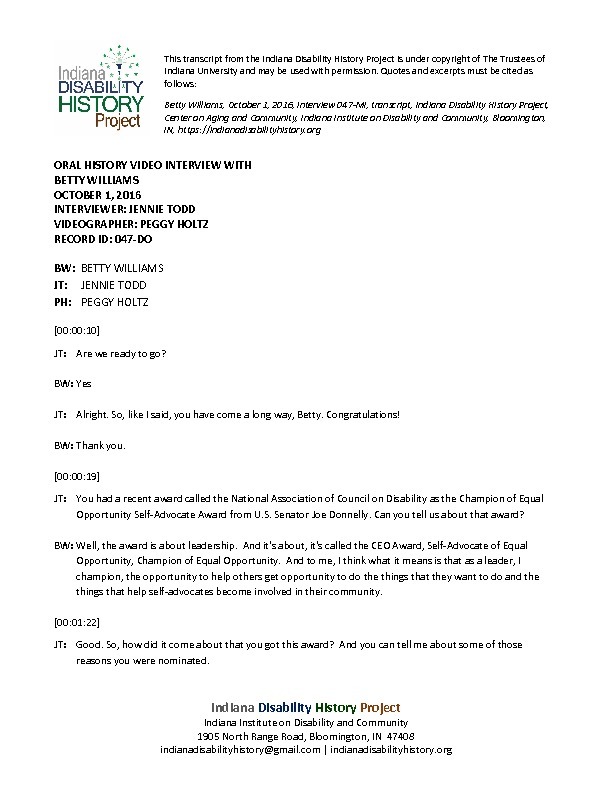 In 2016, Betty Williams received the Champions of Equal Opportunity Award from the National Association of Councils on Developmental Disabilities. Betty received the award for her leadership in promoting voting rights, serving on committees addressing disability issues, organizing self-advocate groups, and training across the country. Betty got her start in the early 1990s when she joined her local advocacy group. In 2014, Betty was appointed to the President’s Committee for People with Intellectual Disabilities. In addition to discussing her work on the national level, Betty shares stories about her work in Indiana. She was involved in changing the name of the MRDD commission to the DD commission. Betty reflects on her advocacy work with Darcus Nims. “She was like my friend, my mentor, my trainer,” explains Betty. Together, they helped incorporate Self-Advocacy of Indiana. They traveled the state training people on the importance of self-advocacy. Betty understands there is still work to be do, which is why she wants to be a part of self-advocacy until she retires. Betty says, “I am going to retire like normal people. You know, I am. I have that plan. But even then I might do something around self-advocacy, you know?” Betty Louise Williams was born in 1959 and died in 2018. She was interviewed in 2016.